Adopting an attitude that "this is our year!" Coach Al Brightman set about getting his Seattle University cagers in shape for the 1950-'51 season, determined to better the Chieftains "so-so" record in the previous campaign. And the world is introduced to SU's O'Brien Twins in 1950. With five lettermen on deck for his third year as Chieftain mentor and with a host of talent up from the University's outstanding frosh squad of last season, Brightman will present a squad somewhat different from the type of teams that have characterized S. U. quints in the past. For one thing, the Chiefs will bo using an "all out" fast break style of play. And they'll have the reserve strength to insure Brightman's VOW to "run our opponents ragged this season." As a matter of fact, the Chiefs will have to master the fast break to off-set a lack of height which could spell trouble for the Maroon and White hoopstars this year. Brightman's likely starting five this soason will average just a mite over six foot in height in contrast to last years quint which measured over six-foot-three. The Chieftains face their largest schedule in recent times, having carded 34 games this yoar including games with the University of Nevada, Oregon College of Education and the always strong Gonzaga University quint of Spokane! While the Chieftains aren't rated as any "sure bet" to set any records this season they could prove dangerous because of the presence of a Twin Brother team in the Chieftain lineup. The "brother act" is the 0'Brien Twins, Ed and John who piloted their S.U. frosh teammates last season to a berth in the national A.A.U. tournament. Described as "Basketball's Gold Dust Twins" by sports scribes for their sterling performances on both offense and defense, they will give a decided "lift" to the Chieftain efforts. They were the nemesis of many a team last season with their twin scoring plays. John O'Brien turned in a 569 point scoring chore for the frosh while Brother Ed tallied 376 points. Their great similarity of features helped to confuse many an opponent thus helping one or the other brother to elude checkers and set up scoring plays. At the season's outset they seemed to have nailed down starting guard berths, and gave promise as the likely mainstays of the Chieftain offensive play department. Three lettermen seen to have clinched starting berths. 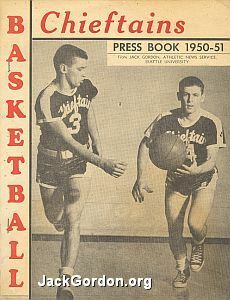 They are: Bob Hodequist, three-year letter-winner from O'Dea, at forward; Bill Higlin, six-foot, five-inch one-year letterman from Lincoln High (Seattle) at center and a former Oregon all-state prep player, Elmer Speidel, who is the likely other forward starter. Like Hedequist, Speidel has won three letters at S.U. but he spent a good portion of last season on the bench. Hodequist was the second highest scoror for the Chiefs last season, counting 297 points in 29 games for a 10.24 scoring average. A hard-driving player, Hodequist measures six feet, two inches. Higlin, who's counted on by Brightman to plug a decided hole in the Chieftain pattern----the Chiefs' lack of height hindered their backboard play in pre-season scrimmages-----was the third man in the individual scoring column last season. In a 29-game stint he counted 227 points for a 7.83 average. Speidel, a veritable dead-eye when it comes to set shots, was "off form" last year because of a dislocated knee that benched him for all but 14 games. If anything happens to the crowd-pleasing O'Brien Twins, or should Bright man's other starters bog down, he won't have to haul out the crying towel. There's just too much reserve talent on the premises to cause the Chieftain mentor any tears. One of the best players up from last year's Papoose (Frosh) team is Jack Doherty, an outstanding candidate to compete with the Twins or even Forwards Hodequist and Speidel for their starting posts. The former O'Dea High school player can be counted on heavily to bolster the Cheiftain's defense. Other newcomers to Chieftain varsity uniforms arc Oscar Holden, former Garfield High ace; another ex-Bulldog player with great ability, Ray Moscatel; Jerry Vaughan, Seattle Prep "ex" and Bob Miller, promising acquisition from Lincoln High School. All these are forward candidates. But most encouraging of all, there are two other lettermen who won't be just loitering around the Chieftain casaba emporium. They're Bob Fiosor, cagey one-year letter-winner who was a standout defensive player for the Chiefs last year and his guard post running mate, Bill Cheshior, also an O'Dea grad and one-year letter-winner. At this writing----the opening of the season----the Chiefs seem to have their best chance in recent years to come up with an outstanding club--but the proving ground, as always, will be the schedule.